Conveniently located between Austin and Houston in historic downtown Brenham, Texas, the Ant Street Inn has 15 stunning guest rooms plus event facilities that can just as comfortably host weddings, receptions, and parties as they can corporate meetings, retreats and events. Take a look around our hotel, and don’t hesitate to contact us if you have any questions or need additional information. 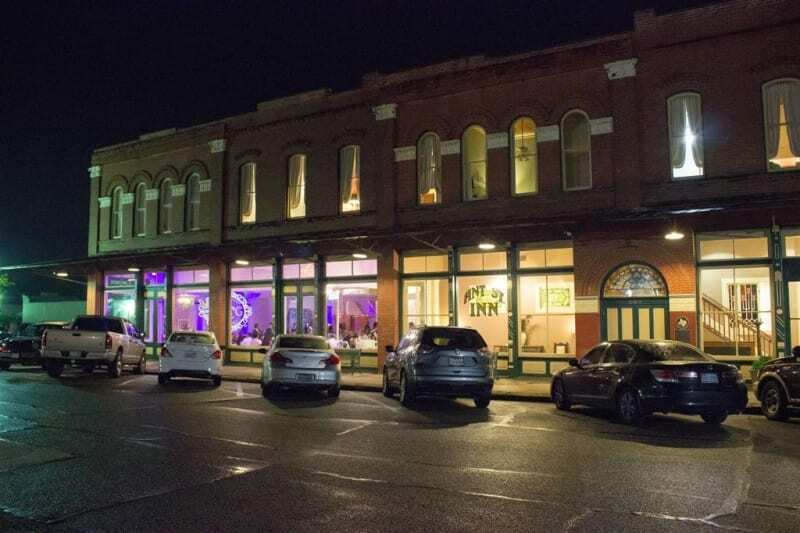 Whether it’s business or pleasure bringing you to Brenham, the Ant Street Inn will provide you comfortable sanctuary from the busy-ness of the day! While the Ant Street Inn boasts exquisite antique furnishings, oriental rugs and stained glass in every room, our guests also enjoy 21st century amenities such as free wireless high speed internet, flat-screen cable televisions, private bathrooms, full made-to-order breakfasts and free parking! Guests also enjoy the rocking chairs on the back veranda overlooking the gardens and fountain. Couples celebrating their honeymoon, anniversary or birthday will want to request the Celebration Time Package to enhance the occasion. The Ant Street Inn and Brenham provide many opportunities to relax! Reserve a room with a large soaking tub for two, or add a Unity Theatre Package to make your stay extra special! Breakfast is served from the expansive menu of the Brenham Grill, the award-winning restaurant right here in our hotel.